APPLICATIONS - For popular RC cars, trucks, boats, turntables, etc. TRUSTED QUALITY - High grade 7.2V battery provides 50 Amp discharge rate for higher power. HIGH CAPACITY, LONG RUNTIME - Quality battery pack with high capacity 5000mAh, rapid charge and long run time. HIGH CAPACITY BATTERY PACK - High power nickel metal hydride battery for RC cars. 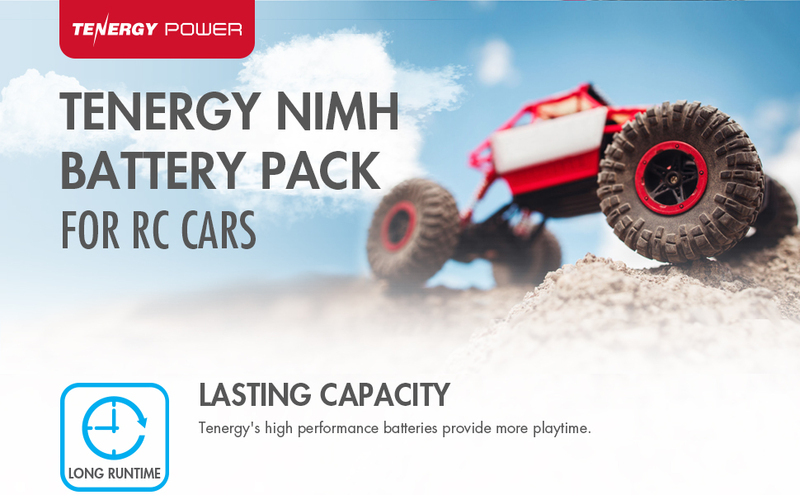 Tenergy 7.2V NiMH battery pack has a high capacity rating of 5000mAh that can run your RC cars and related applications much longer than NiCd cells. HIGH OUTPUT - Uniquely designed & manufactured for high RC racing performance and delivers power when you need it. The Tenergy 7.2V RC battery delivers max discharge rate of 50 Amps to push your RC unit to the peak of its abilities. 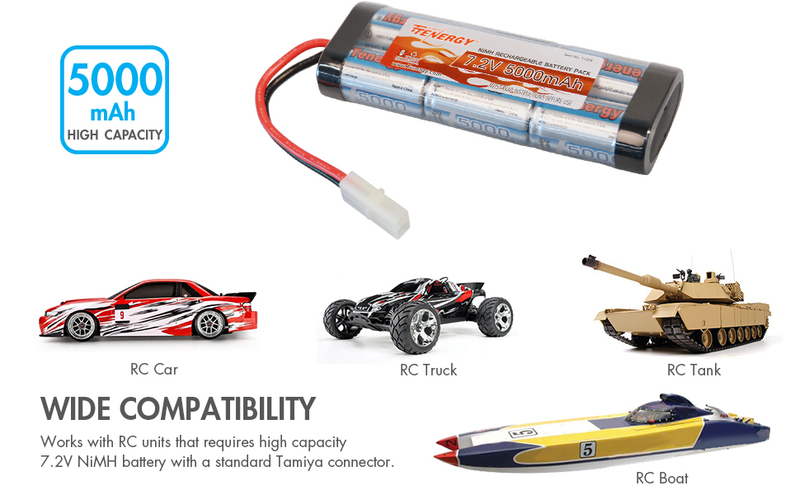 PAIR WITH POPULAR 7.2V RCs - Use Tenergy replacement RC battery to deliver the best performance for your radio controlled brands and hobbies with RC cars, RC tanks, RC trucks, RC boats such as Traxxas, LOSI, Associated, HPI, Kyosho, Tamiya brands, RC10 cars, and turntables. Will also fit many other series and models, we recommend matching the connector and measuring the RC unit battery compartment for best fit. PERFECTLY SIZED - Our RC racing battery is made of sub C battery cells and fits all RC10 cars. It has a standard Tamiya connector and supports rapid charging for faster charge times. Standard dimension: 5.35" (Length), 1.87" (Width), 0.96" (Height). LONGER LASTING BATTERY - Tenergy rechargeable NiMH battery pack has no memory effect so you can charge your batteries anytime. Even when they are close to full or partially drained you won't have to worry about long-term memory effects, get the full capacity every time. No need to fully discharge before recharging. Note: Please always check the dimensions of your battery compartment before purchasing the product. Fully recharge your new battery pack when you first receive it. Do not over-discharge the battery, stop using it when you notice a drop in performance. Do not over-charge the battery, remove the battery from charger when you are done recharging. Heat lowers battery life, do not charge or discharge the battery when it's hot. Always let the batteries cool down to room temp before using it/charging it. Do not store the battery with low voltage, recharge after each use to avoid over-discharge. Always store the battery in a dry and cool place, never expose it to heat or direct sunlight. Recharge the battery once every 6-month, if they will be unused or stored long term. Does it work and fit in a heng long tiger 2 rc tank? We recommend customers compare the battery dimensions, voltage, and connector for compatibility with their device.